Although dental implants in Scarsdale, NY might seem like a space-age procedure, they have been used in professional dentistry for more than 20 years, and modern technologies have made implants better than ever. 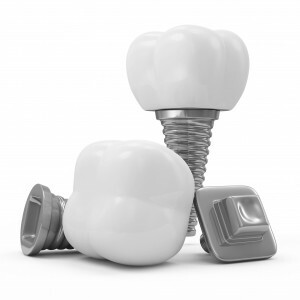 Dental implants are small titanium posts anchored into the mouth to support false teeth. The implant is topped with an abutment, which connects it to a permanent crown. Because implants are independently supported by natural bone tissue, they help to prevent bone loss while protecting the surrounding teeth and providing a realistic, comfortable tooth replacement. Dental implant technology was actually invented on accident by Per-Ingvar Brånemark in 1952. Brånemark and his team were studying healing and blood flow by inserting optical devices into the legs of rabbits. These optical devices were housed in a titanium case. When Brånemark tried to remove the devices a few weeks later, he realized that the posts had fused with the rabbits’ bone tissue. Brånemark realized that this technology could be applicable in the world of dentistry, so he continued his research and installed the first set of dental implants in the mid 1960’s. Although Brånemark had some challenges convincing the rest of the medical and dental world that his technology worked, he was able to win widespread recognition for his work by the mid 1980’s. Since then, dental implants have become the most effective tooth replacement option available. Dental implants are incredibly easy to care for, and can be brushed and flossed just like the rest of your natural teeth. Also, dental implants don’t tug on other healthy teeth like dental bridges do, helping to preserve dental arches as they are. Once dental implants are completely healed, they are incredibly strong and stable, helping patients to enjoy a renewed sense of confidence in their smiles. People with dental implants don’t have to worry about their teeth coming loose as dentures are known to do; they are just as worry-free as natural teeth. Dental implants can be crafted to look just like the teeth they are replacing or designed to transform a smile. Made with materials that mimic the color and opacity of the natural teeth, dental implants are incredibly realistic looking, even at a close distance. With proper care and maintenance, successfully integrated dental implants can last the rest of your life. For more information about dental implants in Westchester County and to see if they are right for you, contact Advanced Dentistry of Scarsdale.